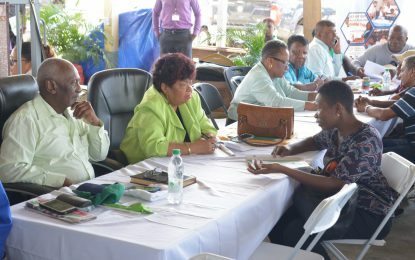 The Regional Administration of Essequibo Islands-West Demerara has completed a hundred per cent of its budgeted works for 2018. 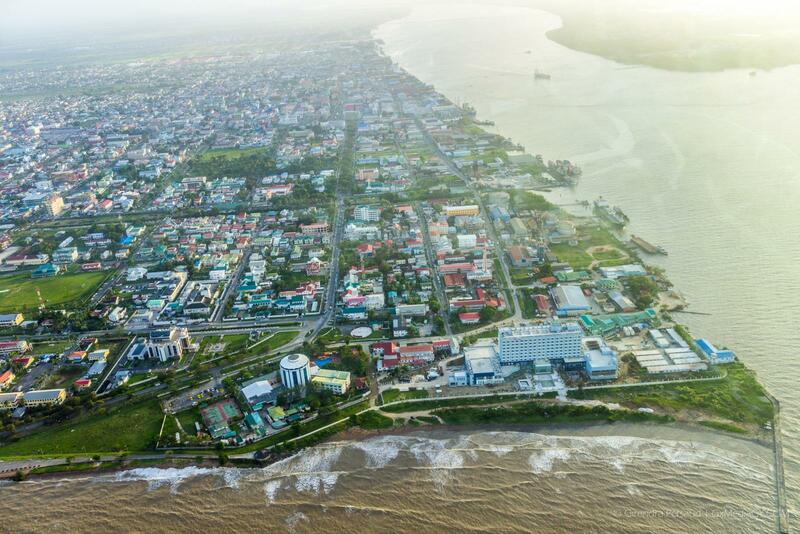 This was disclosed at a meeting headed by Regional Executive Officer (REO), Denis Jaikaran who met with officials from the Region Three’s Engineering Department, Regional Chairman, Julius Faerber and Vice-Chairman, Sheik Ayube on Tuesday last. [In the photo, from left to right] Superintendent of Works, Parramdeo Persaud, Vice-Chairman, Sheik Ayube, Regional Chairman, Julius Faerber, Regional Executive Officer, Denis Jaikaran, Regional Engineer, Vaughn Solomon and Snr. Superintendent of Works, Shanganan Singh. The lavatory facilities, 12 schools have similar facilities for the first time. Some of the projects completed are the asphaltic road and heavy-duty bridge at Zeelugt New Scheme which now provides a second egress and ingress for that community; the rehabilitated roads at De Kinderen, the Sera Lodge road at Stewartville that now provides better access to school children; refurbishment of the Levan’s Street bridge and the Good Intent heavy-duty bridge; work on the Stanleytown sluice and revetment, Hubu’s ramp and landing, Salem revetment, Tuschen Middle Walk’s irrigation control structure among others. Also, several schools were rehabilitated and lavatory facilities were constructed. Some of the schools that benefited are Wales Primary, Essequibo Islands Secondary, Vreed-en-Hoop Nursery, Aliki Primary in the Essequibo River, Windsor Forest Nursery and Primary, Tuschen Primary, Vergenoegen Secondary. The REO further explained that the success of Region Three was possible because of the commitment to ensure that the quality of life improves for all residents of the region. “… for the little over 39 months that we have been working in this region, it is without a doubt that we have seen tremendous improvement. From my assessment, the good life has been there for all. We want to build on that. I want to encourage all the staff to continue this level of co-operation and dedication to the region for its success,” Jaikaran said. Regional Chairman, Julius Faerber, in acknowledging the REO’s report, commended the officers of the region for a job well done. “I am pleased to know that Region Three has now established the precedence of completing its entire capital works. We completed all our works in 2016, 2017 and now 2018. I hope this level of enthusiasm continues in 2019 and beyond,” Faerber remarked. The Engineering Department is supervised by the Regional Engineer Vaughn Solomon while the Agricultural programme is supervised by Senior Superintendent of Works, Shanganan Singh. Superintendent of Works Parramdeo Persaud oversees the capital works under the Education Delivery programme.